Sharpton Replies to Bush Rev. 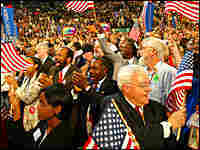 Al Sharpton energizes the audience at the 2004 Democratic Convention with his response to questions asked of African-American voters by President Bush at last week's National Urban League convention. Rev. Al Sharpton energized the audience at the 2004 Democratic Convention with his response to questions asked of African-American voters by President Bush at last week's National Urban League convention. At that meeting, Bush asked his audience if they were being taken for granted by the Democratic Party, and urged them to consider the benefits of voting Republican. Sharpton, invoking the style of an open letter to the president, said, "Read my lips, 'Our vote is not for sale.'" With his speech extending far past his allotted seven minutes, Sharpton roused the FleetCenter crowd with a nearly 20-minute discussion of civil rights, the Iraq war and Bush's policies. The remarks represent the first major break from the carefully crafted schedule of the Democratic Convention, which has seen speakers conform to party expectations of amity -- and brevity -- as they echoed themes in Kerry's campaign platform. Speaking later Wednesday were Michigan Gov. Jennifer Granholm, Gen. John Shalikashvili, and the vice presidential nominee, Sen. John Edwards.